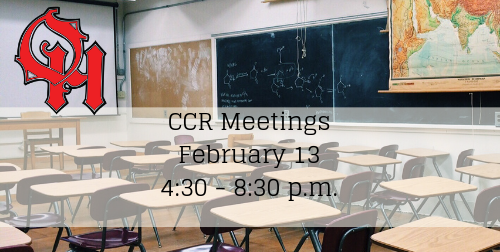 The January 30 CCR Meeting has been rescheduled and will be held on February 13. For your convenience and to hold your appointment time for you, all scheduled appointment times from January 30 have been rescheduled to the February 13 CCR Date. If you are unable to make this appointment, please log back into Sign-Up Genius to cancel and reschedule your time. If you have yet to sign-up for a CCR Meeting and would like to do so, go to Sign-up Genius and sign-up for one of the remaining two CCR Dates: February 7 or February 13 from 4:30 to 8:30 p.m.
To access Sign-Up Genius, please visit the OHLSD portal (ohlsd.org), click on the word “Parents” and then click on the icon for “OHHS Conference Scheduling.” This will bring you to a directions page and a link for each grade level. After selecting the link for your student’s grade level, be sure to sign up for a timeslot with their Tartan Time Teacher. If your student has an individualized education plan, please schedule your CCR meeting with his/her intervention specialist.